How did you find yourself in this niche of the food industry? Chef Ian Knauer: After I wrote my cookbook and produced the TV show, people would reach out to me asking where they could visit. I’ve never wanted a restaurant; instead I’ve always done best in an environment that allows me to learn and at the same time gives me enough space to be creative. A restaurant (unless you’re really good at running a restaurant) often bogs a chef down and doesn’t allow enough time for creativity. Since my entire career in food has been about learning (and then teaching), it made a lot of sense to open a school. 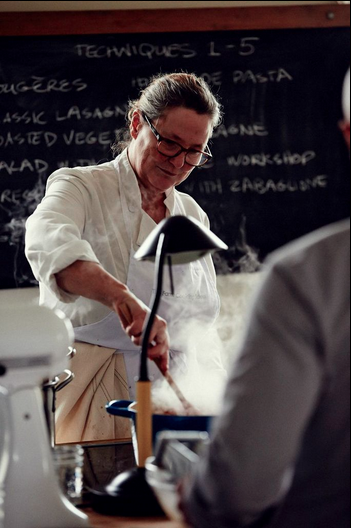 Chef Shelley Wiseman: After several years in the restaurant business (an amazing place to learn but not a great life-style) in both New York and Paris, I moved to Mexico, where my father and stepmother lived and I had spent some of my growing up years. People kept asking me for cooking classes there, and before I knew it, I had a group of ten architects to teach (that’s another story!). And I discovered that I not only was a natural teacher, since I had always asked the kind of questions they did, but that I loved teaching and working directly with people instead of behind the scenes in restaurant or catering kitchens. 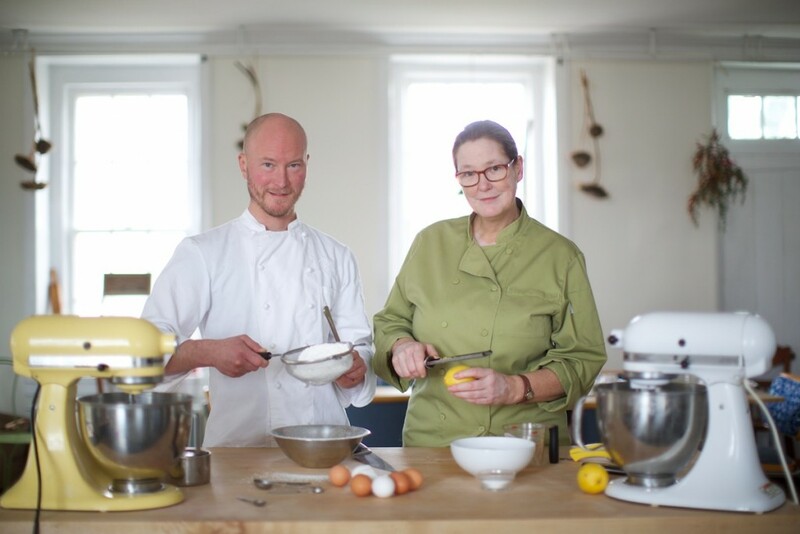 It has been my favorite way of plying my trade ever since, and I’m glad to find myself doing it again at The Farm Cooking School. Any child/teenage food industry jobs? Ian: Yes, I worked as a cook at Little Caesar’s Pizza in Allentown, Pennsylvania, when I was in high school. Shelley: I worked in my mother’s restaurant (The Dory in Shelter Island, New York) as a teenager as a dish washer. I was fired after two days! They just didn’t think I was strong enough to take the garbage out. Ian: Hard to say. I grew up in a family that always cooked and sat down together to eat, so food has been a part of my life since before I can remember. Shelley: Fresh orange juice, blueberry pancakes and bacon at the barn, our summer house in Bridgehampton. And of course, fresh corn! Ian: I’m a very tactile learner. I understand how things work by touching, tasting and smelling, and cooking lends itself to that sort of education. It’s a way of learning I can easily understand, and therefore I end up being naturally good at it, which of course, is very satisfying. Shelley: Those summers in Bridgehampton, New York were full of amazing fresh food, tomatoes, peaches, corn, clams, crabs, lobster and lots of butter. My grandmother would put up the peaches and tomatoes so we’d even get the glow of summer sun mid-winter in her Greenwich Village home. Ian: Crab cakes (my mom’s from Baltimore). Mincemeat pie (my dad’s from Pennsylvania Dutch country). Shelley: Swordfish was one of my favorite foods, better than hamburgers (even really good, fat, juicy hamburgers). Steamed whole artichokes with Russian dressing. Still my secret favorite way to eat artichokes and what I am most likely to cook for myself at home. Any specific food memories/stories that you want to share? Ian: It was my job to mow the lawn at my folks’ farm in Pennsylvania when I was a kid. It’s a hot and stick job. I remember my grandfather handing me a perfect strawberry from his garden. I can remember everything about the way it tasted, still. The sweetness, the warmth of the sun in the berry, the seeds, the smell of gasoline from the mower — everything. Shelley: I moved to Mexico when I was 14 to live with my father, stepmother Sarah and three little half brothers and sisters. Everything about Mexico felt alive. I remember eating my first taco al pastor with salsa and pineapple. It was so amazingly vibrant that I felt like I was tasting life itself, I felt the earth breath; all my senses were awakened, and I felt nourished to the soul. Ian: I have always eaten everything. When I was a kid my mother was on a first name basis with the poison control center. Even to this day, I taste before and deal with the consequences after. Just the other day, I ate parsnip greens, which as it turns out are very poisonous. Survived, yet again. Shelley: I was never a picky eater; however, I have never liked calves liver! Still don’t. I am not as crazy adventurous as Ian, either. I used to hate cilantro, but now I love it. One of my childhood favorites that is still a guilty pleasure is Twizzlers. Any childhood cooking accidents in the kitchen? Shelley: My first attempt at cooking at about 8 years old was an-open-the-cabinets-and-put-it-together experiment with friends which included things like cocoa powder and mustard. Yuk! Growing up, what was your favorite meal/food/snack to eat outside? Did you enjoy eating outside anywhere in particular? How about now as an adult? Any benches you love to eat on? Ian: These days I love sitting by the Delaware River and eating. I’ve always loved eating outside. Shelley: I loved (still do) eating corn on the cob outside in Bridgehampton, and in the city as a kid I would crave either a creamsicle or a toasted almond Good Humor when we’d go out to Central Park across the street. I grew up on 98th and 5th. I love sitting on the park benches outside the park wall where the Good Humor truck would be. The swings inside the Park at 98th street were a favorite spot. What do you think of the modern food world (from franchise chains to Starbucks, from the Food Network to Groupon, from Yelp to foodie bloggers)? Ian: Big question. In some ways, we are living in the greatest time yet for American food and food culture. There is so much awareness and education on what is good, great and bad food. I hope we use all the information we have available to weed out the great food and thoughts from the not-so-great. Shelley: The modern food world is such a dichotomy between the worst practices of factory farming and unhealthy fast food, super-sized sodas and chemical additives, on the one hand, and a growing amazing culture of young, thoughtful farmers who care about the land and the quality of life of animals, chefs who celebrate farm to table and even companies like Applegate who are seeking to improve the quality and health of mass market foods, on the other hand. I do want to make a point though. Of course supporting your local community with locally, seasonally-sourced ingredients is fantastic and the closer you are to your food source the better it will taste (for fruits and vegetables) and the better it will be for the environment. But we live in a global economy, and we cook that way, too. We use vanilla beans from Madagascar and chocolate from Venezuela, as chefs we seek quality and variety. We cook Thai food and Mexican food, so we source chiles grown and smoked in Oaxaca as well as Galangal from Thailand. Some of those things we can learn to grow locally, some we cannot because we don’t have the correct climate or the right birds to pollenate. When I see manila mangoes from Mexico in May, I look forward to using them. We also support global economies. That is not something to gloss over or feel guilty about. The important thing is to get what you can locally and look for sustainable, humane practices for whatever you use. Chickens are among the worst factory farmed animals, and yet people will complain about inhumane treatment of foie gras ducks but not bat an eye when consuming factory raised chicken almost daily (and the lot of factory farm chickens is far worse than ducks raised for foie gras). Be conscientious about the source of your food. It is worth paying more for animals that are treated humanely. It is, at the very least, good for your karma. What do you think of the growth of farm-to-table food/restaurants/etc.? Ian: Again, as a concept, I am completely behind sourcing out food seasonally and locally. It takes a little savvy on the part of the consumer to figure out who and which restaurants are actually living the ethos and which are taking advantage of the bandwagon. Shelley: I think it is great, but I think the global economy, as I said earlier, has its place, and supporting farmers around the world that have sustainable practices is valuable. What family recipes do you want to share with us? Ian: My great grandmother’s crab cakes have been on the docket lately. The Stockton Inn has them on their menu at the moment and they’ve proven to be very popular. My great grandmother bought the recipe for $50 from a black woman who sold her crab cakes on the street in Baltimore – this would have been in the 30’s or so. They are the best I’ve ever had. Gourmet magazine published the recipe a few years back. Here’s the original link. Enjoy my great grandmother’s crab cakes! Shelley: The most long standing family recipe, from my paternal grandmother, Baba, who invested in our ramshackle farm cottages back when Bridgehampton, New York was more farm land than McMansions, and the property was surrounded by fields of cucumbers and potatoes not hedges, is blueberry muffin. I say that in the singular because we would always make it in a large round ring pan with a hole in the middle so it would cook evenly. I still like it better that way because there is more fluffy blueberry-laden interior than crust. We used to go skinny dipping in the ocean in my father’s old Packard before breakfast. My father used to call all sleepy heads to get up, we’d pile into the car with its wonderful musty smell in our pajamas and nightgowns and shed them as we ran to the ocean’s edge and jumped in without thinking of the cold (because you couldn’t!!). Then we’d come back to that smell of baking blueberries and protect our portion of fresh orange juice from my father’s sneaky reach. Enjoy my grandmother’s blueberry muffin! The Farm Cooking School, located at Tullamore Farms — a working farm in Stockton, New Jersey — offers an array of classes, dinners and workshops, which will enable novices to feel confident in the kitchen. 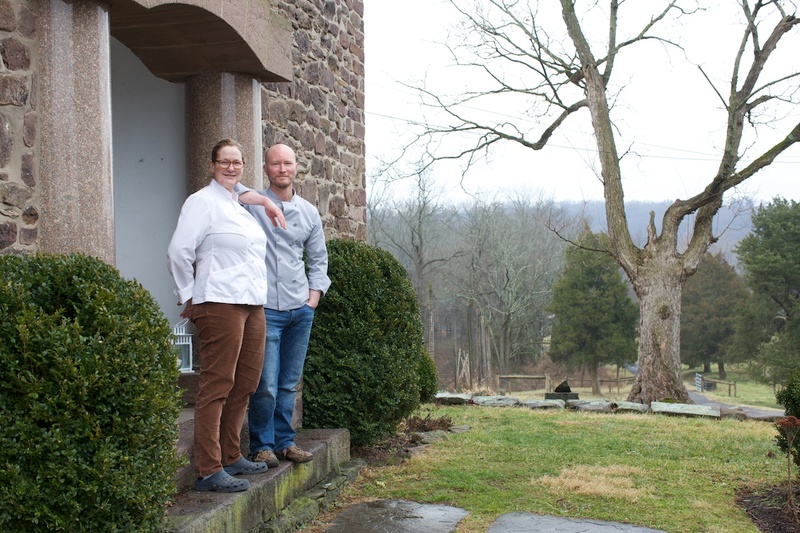 Experienced chefs Ian Knauer and Shelley Wiseman have foodies flocking to this rustic gem, nestled in the western New Jersey countryside along the Delaware River and across from bucolic Bucks County. Stockton, a popular bed & breakfast destination and a well-known stop for antique and art collectors, is a convenient 1.5 hour drive from New York City and 45 minutes from Philadelphia. Novices and gourmands alike can come to learn about everything from knife skills to baking the perfect loaf of bread to complex French sauce-making. 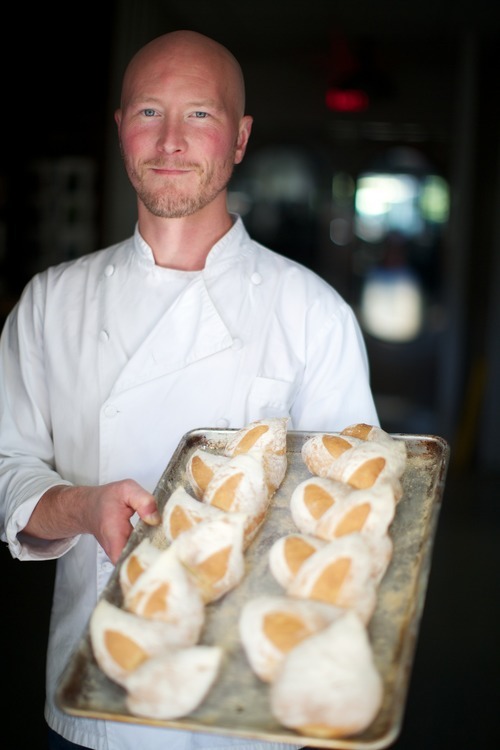 Chef Ian Knauer is a cookbook author, food writer and chef and has contributed to publications from Everyday with Rachel Ray to The Wall Street Journal. Knauer, whose PBS cooking show The Farm (and book of the same name) were inspirations for the school. Knauer, who wanted to teach people how to cook, was also a food editor at Gourmet magazine for a decade. 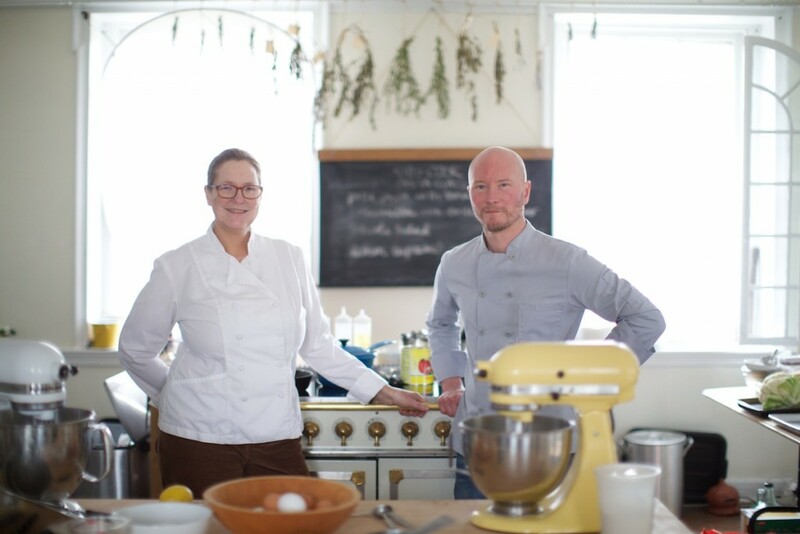 Chef Shelley Wiseman, a veteran culinary professional with expertise in French and Mexican cuisines (she lived and cooked in both countries) met Knauer at Gourmet, where she was a food editor for 12 years. After a stint as the senior food editor at Fine Cooking Magazine and writing the cookbook Just Tacos, Wiseman joined Knauer to develop the school, returning to her real passion — teaching. 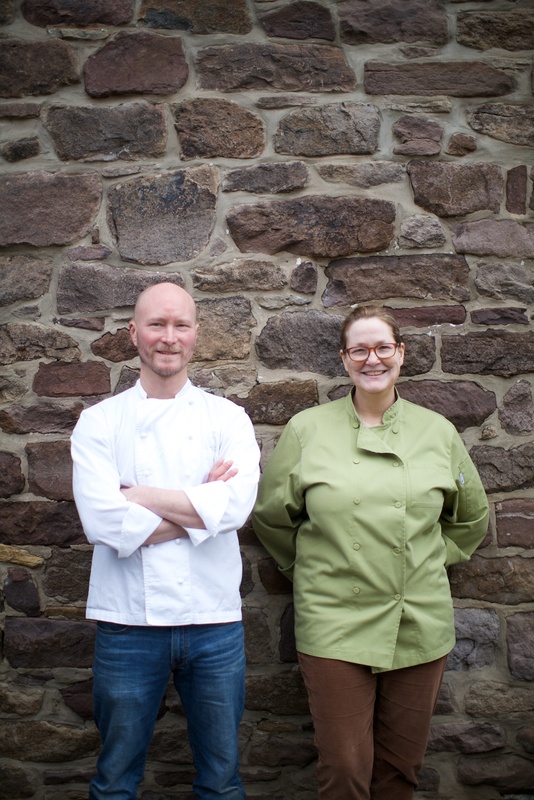 The School sources ingredients directly from Tullamore Farms and other nearby purveyors, which is especially evident in their Wednesday night CSA dinners. For more on the The Farm Cooking School, visit TheFarmCookingSchool.com. And follow them on Twitter at @TheFarmCooks and @IKnauer, on Facebook and on Instagram at @TheFarmCooks and @IKnauer.